This protocol describes a novel mechanical chopping method that allows the expansion of spherical neural stem and progenitor cell aggregates without dissociation to a single cell suspension. Maintaining cell/cell contact allows rapid and stable growth for over 40 passages. 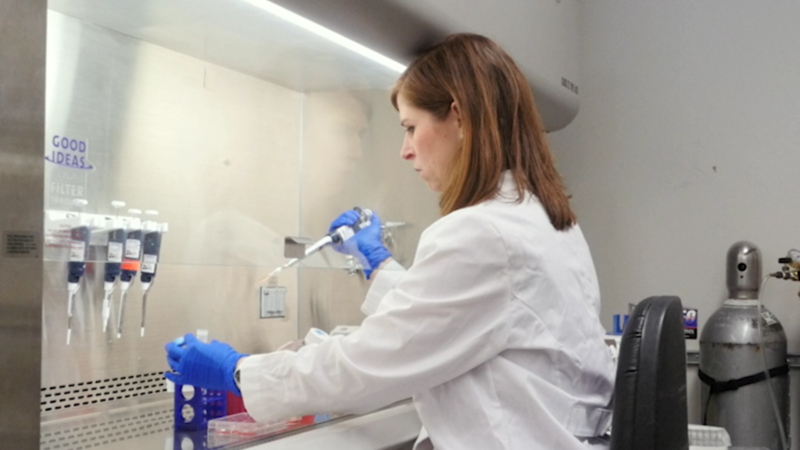 Shelley, B. C., Gowing, G., Svendsen, C. N. A cGMP-applicable Expansion Method for Aggregates of Human Neural Stem and Progenitor Cells Derived From Pluripotent Stem Cells or Fetal Brain Tissue. J. Vis. Exp. (88), e51219, doi:10.3791/51219 (2014). A cell expansion technique to amass large numbers of cells from a single specimen for research experiments and clinical trials would greatly benefit the stem cell community. Many current expansion methods are laborious and costly, and those involving complete dissociation may cause several stem and progenitor cell types to undergo differentiation or early senescence. To overcome these problems, we have developed an automated mechanical passaging method referred to as “chopping” that is simple and inexpensive. This technique avoids chemical or enzymatic dissociation into single cells and instead allows for the large-scale expansion of suspended, spheroid cultures that maintain constant cell/cell contact. 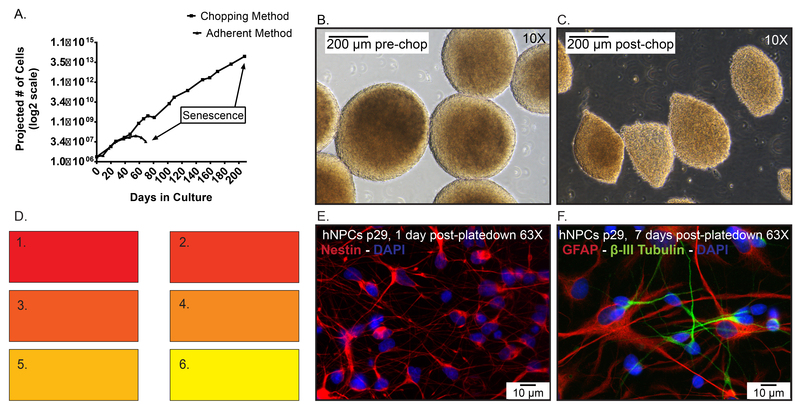 The chopping method has primarily been used for fetal brain-derived neural progenitor cells or neurospheres, and has recently been published for use with neural stem cells derived from embryonic and induced pluripotent stem cells. The procedure involves seeding neurospheres onto a tissue culture Petri dish and subsequently passing a sharp, sterile blade through the cells effectively automating the tedious process of manually mechanically dissociating each sphere. Suspending cells in culture provides a favorable surface area-to-volume ratio; as over 500,000 cells can be grown within a single neurosphere of less than 0.5 mm in diameter. In one T175 flask, over 50 million cells can grow in suspension cultures compared to only 15 million in adherent cultures. Importantly, the chopping procedure has been used under current good manufacturing practice (cGMP), permitting mass quantity production of clinical-grade cell products. There is a long history of expanding rodent neural stem cells in culture as either a monolayer1-3 or aggregate neurospheres4-7. In addition, human neural progenitor cells (hNPCs) isolated from various regions of the developing central nervous system8-17 have been expanded in vitro. These cells are bi-potent, capable of differentiating into both astrocytes and neurons and have been a very useful tool in studying neural development18,19 and disease mechanism20,21. hNPCs have also been transplanted into many different animal models of central nervous system disease with varying levels of integration, survival and functional effects22-24. Traditionally, rodent or human fetal-derived NPCs are exposed to growth factors – often epidermal growth factor (EGF) and/or fibroblast growth factor-2 (FGF-2)25-28 – and both adherent29 and three-dimensional spheroid systems are typically passaged using enzymatic dissociation into a single-cell suspension30-34. The standard method to expand cells for research or clinical use is as an adherent monolayer due to easy manipulation. However, we have shown that passaging monolayer and neurosphere hNPCs with enzymatic or chemical solutions resulted in early senescence35. In addition, enzymatic dissociation may result in increased levels of differentiation and karyotypic abnormalities based on data demonstrated with embryonic stem cells36-38. Although the standard method of passaging hNPCs has produced current good manufacturing practice (cGMP) grade products that have gone into phase 1 clinical trials (Stem Cells Inc., Neuralstem Inc.), the method permitted only a few rounds of cell amplification, limiting the banking potential. Clearly, large research experiments and future clinical trials could benefit from the ability to propagate cells in bulk and with delayed senescence to permit large-scale growth and cell banking. To address this need, we developed a novel and automated way of mechanically passaging intact neurospheres by “chopping” them into small clusters to maintain cell-to-cell contact. 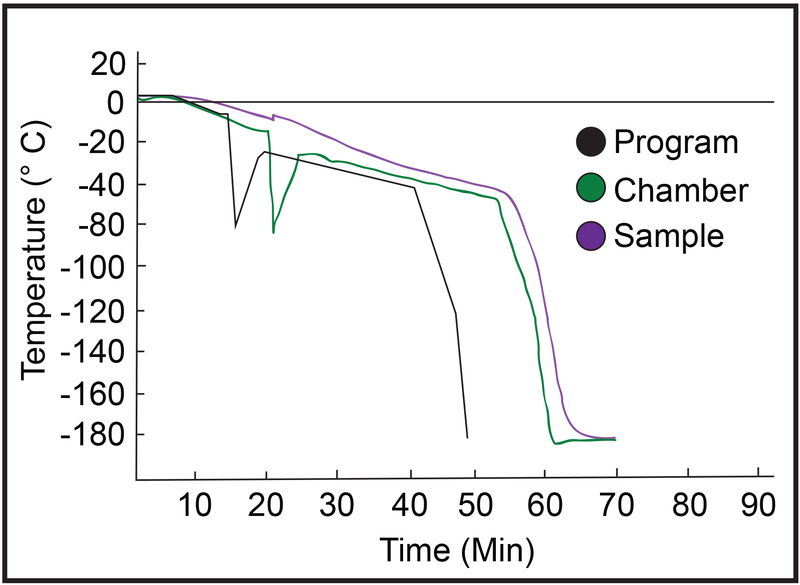 This method greatly increased their lifespan39 and suspension culture permits a more efficient use of incubator space compared to monolayer cultures, as seen with an alternative 3D bioreactor culture method40. The provided chopping protocol allows for the production of large-scale banks from one fetal sample greater than passage 10, an unlikely feat using standard passaging methods. While this method for passaging hNPCs is unconventional, it is growing in popularity and was recently, published with other cell types such as neural stem cells derived from human embryonic and induced pluripotent stem cells, enabling large scale expansion for various applications including in vitro disease modeling41-46. Importantly, a cGMP-grade hNPC cell bank has already been produced with the chopping method, demonstrating that the technique can be applied towards future clinical applications. This procedure involves the use of cell culture products derived from humans or animals. All derived tissues must be approved before use by the appropriate Institutional Review Board(s) and/or the Institutional Animal Care and Use Committee(s). All bio-hazardous waste must be disposed of according to safety regulations decided upon by the respective institution. Know and follow all of the apposite safety and disposal guidelines throughout this procedure. Obtain a glass Petri dish, 8.5 cm filter paper circles and double-edge prep blades. Place a piece of filter paper in the Petri dish and transfer several unsheathed blades onto the filter paper in the Petri dish. Repeatedly layer filter paper and blades until the Petri dish is roughly 75% full, cover with Petri dish lid and autoclave. Store in a sterile or enclosed environment to preserve sterility. Autoclave 18 cm forceps and an autoclavable nut-driver in a sterilization pouch. For cGMP production, autoclave several stainless steel shim discs in sterilization pouches. For more information regarding the shim disc, see step 3.5. Sanitize the bio-safety cabinet (BSC) with 70% isopropyl alcohol (IPA). McIlwain Tissue Chopper (chopper). Wipe down all surfaces with 70% IPA, especially the chopper arm (Figure 1B). The entire chopper can be decontaminated using ethylene oxide if necessary. One autoclaved nut-driver or nut-wrench (included with the chopper, Figure 1I), one 18 cm forceps, one set of standard size micropipettors (20 µl-1,000 µl), one pipetaid and tube racks. Sterile disposable serological pipettes, barrier pipet tips, 15 ml conical tubes, 60 mm Petri dishes, double-edge prep blades and appropriately sized T flasks. CAUTION: Only handle the sharp blades with a forceps. Expand hNPCs in Maintenance Media (MM) consisting of Neural Stem Cell Expansion Medium, EGF at 100 ng/ml and Leukemia Inhibitory Factor (LIF) at 10 ng/ml. Transfer the reagents and filtration device(s) required to prepare media into the BSC. Re-suspend the lyophilized EGF using Neural Stem Cell Expansion Medium and prepare aliquots at 100 µg/ml to store at -80 °C for up to 1 year. LIF is stored as purchased at 4 °C for up to 6 months or the expiration date given by the manufacturer. Transfer MM reagents into the BSC. Combine all reagents in an appropriately sized filtration device and filter using a vacuum apparatus. Store at 4 °C for up to 3 weeks. The two most important factors to address before chopping is sphere diameter and media conditioning or color. Conditioned media (CM) is defined as medium that has been metabolized by the hNPCs in culture under incubator conditions (37 °C, 5% CO2, 95% humidity). As the cells metabolize the media the phenol red component will shift from a pink to yellow color signifying a more acidic environment (Figure 5D). Hold the flask(s) of hNPCs up to the light to address the media color (see discussion for details). Scan through the flask with a microscope to observe the cells. Use a reticle to examine sphere size. If many spheres have a diameter of 300 µm or greater, proceed with the chopping process. Chop the cells every 7-10 days. If a chop is not warranted, exchange 25-75% of the CM with fresh media every 3-4 days depending on how quickly the cells are metabolizing the media. Continue to exchange media until the spheres are the large enough to passage. hNPCs are typically chopped at a ratio of 1:2, from smaller flasks to larger flasks. Use Table 1 as a reference guide for flask size and volume recommendations. * 2 T175s is the maximum number of flasks that can be chopped at a time. Chop in sets of 2 T175s and refer to step 7. Table 1. hNPC expansion paradigm. Description of a typical expansion scheme for hNPCs. It is standard to expand two-fold volumetrically every 7-10 days. Figure 1. McIlwain Tissue Chopper. 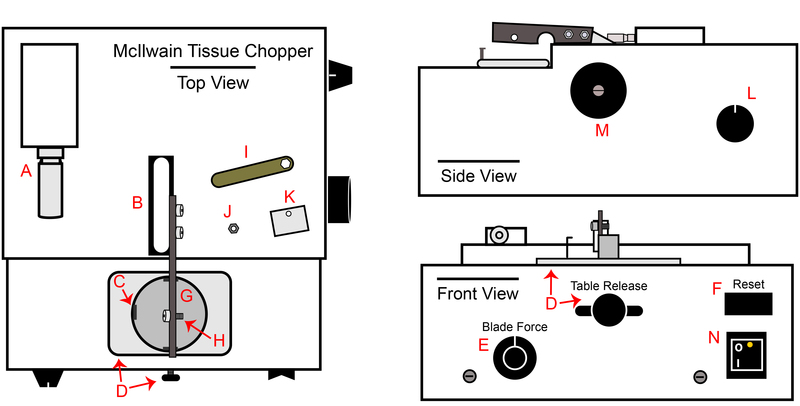 A) Chop thickness adjustment micrometer, B) Chopper arm base and attached arm, C) Hook on plate holder for Petri dish, D) Table release knob and tray, E) Blade force control knob, F) Reset switch, G) Plate holder, H) Bolt attachment for blade, clasp and nut, I) Nut wrench included with chopper, J) Blade/clasp nut, K) Blade clasp, L) Automated chopping speed control knob, M) Manual chopping arm operating knob, N) Power switch. Plug the chopper into an outlet in the BSC and turn on the power switch (Figure 1N). Set the chopping distance to 200 µm (Figure 1A). Set the blade force to 270° or 9:00 if the knob was a clock (Figure 1E). Confirm that the automatic speed knob is rotated as far counterclockwise as possible. (Figure 1L). Move the table release all of the way to the right confirm the plate holder is stable (Figure 1D). Rotate the manual arm manipulator clockwise to raise the arm to its maximum level (Figure 1M). The manual arm manipulator must only be rotated clockwise. Aseptically transfer a sterile, double-edged chopping blade onto the chopper arm bolt using a pair of forceps (Figure 1H). Complete this step only for cGMP passaging, as the Petri dish alone is sufficient for research-grade processing. As noted in step 2.1.4, shim discs placed inside of the Petri dish base are required for cGMP. The shim disc prevents plastic shards from incorporating into the spheres during the chopping procedure. For each planned chop, transfer one shim disc into the base of each Petri dish and cover. Aseptically place the clasp (Figure 1K) over the blade using the forceps. The curved portion of the clasp must be over the top edge of the arm. The clasp will not stay on the arm until the nut has been securely fashioned. Use the forceps to hold the clasp onto the arm and secure the nut (Figure 1J) onto the bolt with the sterile nut-driver. Leave the nut a ¼ turn loose. Transfer the suggested volume of MM into the new flask(s) as per Table 2, Column C.
Aseptically transfer the cells from the incubator into the BSC. Lean the flask(s) on a tube rack (Figure 2A) and allow the spheres to settle in the flask(s). Once settled, aspirate up to 12 ml of supernatant with a 5 ml or 10 ml serological pipette and rinse all loosely adherent spheres from the surface of the flask(s). Repeat as necessary and settle the spheres between rinses. Transfer the suggested volume of CM into the new flask(s) according to Table 2, Column D. If passaging two or more T175 flasks, see step 7.1. Transfer all remaining CM and spheres into a new 15 ml conical tube. Allow the spheres to settle and discard the used flask(s). Critical Step: Slowly transfer the spheres from the 15 ml conical tube onto the 60 mm Petri dish or shim disc in the lowest feasible volume; 0.1-0.5 ml is recommended (Figure 2B). Keep the remaining volume of CM as it will be used to rinse the cells from the dish post-chop. Try to minimize the surface area covered by the media and spheres on the dish (Figure 2C). Figure 2. Sphere preparation for chopping. A) Lean the flask(s) against a tube rack or similar item to settle the spheres in the corner of the flask. B) Transfer the spheres as densely as possible from the conical tube to the Petri dish. C) Pool the spheres from the conical tube in the middle of the Petri dish. D) Remove as much supernatant as possible from the top of the pooled spheres. E) Spread the spheres out using the side of a plastic micropipettor tip. F) Gently move the spheres to one side of the pool. G) Example of spheres that have been moved to one side of the pool to facilitate media removal. H) Condensed spheres spread out on the Petri dish, ready for chopping. Click here to view larger image. Next, the spheres need to be condensed by removing the supernatant transferred over in step 4.6. Transfer the supernatant back into the 15 ml conical tube with an aerosol barrier-tipped micropipettor (Figure 2D), avoid the removal of spheres. Start by removing as much media as possible from the top of the media/cell pool. When it is not possible to remove media without spheres, proceed to the following step. Table 2. Media transfer guide pre/post-chop. Suggested volumes to use during the chopping process. Spread the pool out using the side of the pipet tip to increase surface area (Figure 2E). Critical Step: Tip the Petri dish slightly towards you and use the side of the pipet tip to gently slide all of the spheres to one side of the pool (Figure 2F,G). Critical Step: When all cells have been relocated, slowly tip the Petri dish the opposite direction. During the process, the media alone will flow away from the spheres. Transfer the media back into the 15 ml conical tube. Minimal sphere removal is acceptable. Use the side of the pipet tip to gently slide all of the spheres back to the center of the Petri dish so the pool has a diameter of 0.5-2.4 cm (Figure 2H). It is important to keep the depth of the sphere pool shallow. If the pool is too deep, the spheres will simply be pushed aside during chopping. NOTE: The diameter of sphere pool cannot be greater than 2.5 cm or the blade will contact the edges of the Petri dish, missing the cells. Transfer the Petri dish onto the plate holder (Figure 1G) and ensure the dish is secured under the plate holder hooks (Figure 1C). The table release knob has notches where it will fit into gear. Use the table release knob to slide the plate holder to the left so the blade is clear of the spheres and locked into gear (Figure 1D). Critical Step: Lower the chopper arm by rotating the manual manipulator knob (Figure 1M) clockwise until the blade snaps down flat onto the Petri dish. Use one hand to press down on the arm mount (Figure 1B) while tightening the nut with the nutdriver. Push the reset button once (Figure 1F). Steady the Petri dish with one hand while turning the automatic arm manipulator knob (Figure 1L) clockwise to the 90° position or 12:00 if the knob was a clock. CAUTION: Keep fingers away from the moving blade at all times. Pass the blade fully through the pool of spheres. Rotate the plate holder 90°. Loosen the bolt and repeat step 5.3-5.5. Aseptically transfer the Petri dish from the plate holder onto a working space in the BSC. Prime a 10 ml serological pipette with the CM in the conical tube from step 4.6 and then transfer 1 ml onto the chopped spheres. Gently re-suspend and transfer into a new 15 ml conical tube. Avoid bubbles and repeat as many times as necessary to collect the chopped spheres. TIP: Minimize scraping the dish as plastic fragments may lift off. This is not a concern if using the stainless steel shim discs. Beware of cells attaching to the inside of the plastic serological pipette. If this occurs, aspirate bubbles intermittently through media in the pipette to detach the cells. Measure the volume of CM and chopped spheres. Add the appropriate volume of MM to achieve the volume listed in Table 2, Column E.
Triturate the spheres 2-3x to break up any loosely fused spheres. Critical Step: Aliquot the sphere suspension into each new flask. Only transfer the sphere suspension into one flask at a time, and re-suspend the spheres between transfers. Aliquoting multiple flasks at a time results in a disproportionate number of spheres in each flask. The final volume in each flask should equal the volumes in Table 2, Column F. See step 7.2 when seeding greater than two T175 flasks. Remove the nut with the nut-driver and then the clasp with the sterile forceps. Decontaminate appropriately with 70% IPA or equivalent. CAUTION: Remove the used chopping blade only with a forceps and discard in a bio-hazard sharps container. Decontaminate all surfaces of the chopper with 70% IPA. There are several differences when passaging more than two T175s. The steps below are alterations of the referenced step. When passaging two T175s, combine all of the media and spheres into one T175 flasks. Allow the spheres to settle and then aliquot the appropriate volume of CM into each of the new flasks as stated in Table 2, Column D. Proceed to the step 4.5. When passaging greater than two T175s, obtain a new T175 flask and label as the CM flask. Complete step 7.1.1 but transfer the CM into the CM flask. Store the flask on the side of the BSC to be used to collect the CM from all flasks until all flasks have been chopped. Then the CM will be equally aliquoted into each of the new flasks. Reference step 6.4 – When chopping the same cell line multiple times, transfer the chopped sphere suspension into a new T75 flask labeled spheres post-chop and record the volume transferred. Continue to combine the cells in this flask after every chop and store the flask in the incubator at 37 °C, 5% CO2, 95% humidity. After all chops have been completed, aliquot the sphere suspension in volume into each new flask. Proceed to step 6.5. The following protocol is for cryogenically preserving hNPCs. Thaw cell freezing medium in a clean water bath at 37 °C and then store on ice. Cell freezing medium can be aliquoted and stored at -80 ˚C for up to 6 months. Fire polish glass Pasteur pipets by rotating the opening of the pipet in a flame. Prepare at least two large and two small bore fire-polished pipets (Figure 3). The spheres will be dissociated by moving from large to small bore pipets. Place TrypLE Select in the water bath at 37 °C for 5 min. Remove and keep at room temperature until ready for use. Figure 3. Fire-polishing glass Pasteur pipets. A) Hold the pipet in the top part of the flame and spin in order to evenly round the edges of the glass pipet. B) Example of a large-bore fire-polished glass pipet. C) Example of a small-bore fire-polished glass pipet. Aseptically transfer the neurospheres into the BSC. Allow the spheres to settle by leaning the flask(s) against a tube rack and rinse the bottom of the flask to remove any loosely adherent spheres. Allow the spheres to re-settle. Transfer all but 5-10 ml of CM into a sterile bottle and measure the total volume. Place the remaining spheres and media into a conical tube. After all cells have settled, transfer all but a small meniscus of CM into the bottle and summate the volume. Aseptically transfer 5-10 ml of warmed TrypLE Select into the conical tube and re-suspend the cell pellet. Transfer the conical tube into the 37 °C water bath for 15-20 min. After 7.5-10 min, gently shake the conical tube to mix. Use the measured CM volume from step 8.5 and prepare an equal volume of MM. Combine and filter the 50% CM and 50% MM solution (CM/MM solution). Aseptically transfer a 40 µm strainer into a 50 ml conical tube. When the incubation is complete, spin the 15 ml conical tubes for 15 sec at 100 x g.
Carefully aspirate and discard the TrypLE Select and any stringy substrate. Leave a small meniscus. Gently add 2 – 4 ml of CM/MM to dilute the remaining TrypLE Select while not disturbing the pellet. Let any dislodged cells re-settle before discarding the wash.
Add 2-5 ml CM/MM solution to the tube spheres. Dissociate the spheres with a 5 ml pipette by triturating a maximum of 10x. Let the undissociated spheres settle for 1-2 min. Transfer the dissociated cell suspension onto the 40 µm strainer to remove fully undissociated clusters. Repeat step 8.12 with a fire-polished large-bore glass pipet and then a small-bore glass pipet. Rinse the strainer with 2-5 ml of CM/MM solution. Mix the cell suspension and remove samples for viability analysis. Dilute the samples with trypan blue at an appropriate dilution factor and count. Use the standard equation below to calculate the average viable cell concentration and calculate the total viable cells. Calculate the total volume of cell freezing media required to re-suspend the cells at 5.0 x 106 cells/ml. 1 ml of cells will be seeded into each cryovial. Transfer the cryovials into the BSC. Centrifuge the cell suspension at 200 x g for 5 min at 4 °C in 15 ml conical tubes for best yield. If 50 ml conical tubes are used for a large scale freeze down, increase rate and time to 400 x g for 10 min. Re-suspend the cell pellet using the cell freezing medium at 5.0 x 106 cells/ml. Aliquot 1 ml of cell suspension into each cryovial. For an even distribution, aspirate 6 ml of suspension and aliquot 5 cryovials x 1 ml. Transfer the remaining 1 ml of suspension back into the pool of cells. Repeat until all vials have been filled. Aseptically seal all seeded cryovials and transfer them onto ice for 5-10 min. Fill the required number of chamber(s) with 100% IPA at room temperature. Transfer the seeded cryovials from ice into the chamber(s) and transfer the chamber(s) into a -80 °C freezer overnight. The cells are stable for up to one week at -80 °C, however it is suggested to transfer the vials to long-term liquid nitrogen storage the following day. Upload an appropriate freezing program to the controlled rate freezer’s software. An example program is listed in Table 3. Figure 4 demonstrates a typical freezing curve for hNPCs. However, the exact program will vary for each freezer model. The standard overall sample rate should be close to -1 °C/min until reaching -40 °C, where the rate of freezing can be substantially increased to at least -80 °C. Table 3. Steps for freezing hNPCs in a controlled rate freezer. Suggested program for hNPC cryopreservation on a controlled rate freezer. Figure 4. Sample freezing curve. Typical freezing curve for hNPCs on a controlled rate freezer. Transfer the cryovials from ice into the baskets associated with the control rate freezer. Be sure to load one cryovial with only cell freezing media to use for the sample temperature probe. Transfer the baskets into the freezing chamber and place the sample probe into the probe vial. Start the program. When the protocol has completed, transfer the vials into long-term liquid nitrogen storage. The following protocol is for thawing cryogenically preserved hNPCs. Transfer the cryovials from liquid nitrogen storage immediately onto dry ice. CAUTION: Vials can have cracks or loose lids allowing liquid nitrogen to enter the vial. When removed from deep freeze conditions, the liquid can boil, immediately exploding the vial. Use proper PPE when removing the vials. Prepare all of the reagents and supplies below ahead of time. Once the thawing process has begun, it is critical to follow through efficiently. Transfer Neural Stem Cell Expansion Medium, MM, a 15 ml conical tube, one 2 ml and one 10 ml serological pipette for each cryovial into the BSC. A minimum of 9 ml of Neural Stem Cell Expansion Medium and 5 ml of MM is required for each vial. Prepare more of each media if necessary. Only thaw one vial of hNPCs at a time. Transfer the frozen cells from dry ice into a clean 37 °C water bath and stir the vial in the water bath continuously. Monitor the volume of ice that has melted. When there is a piece of ice about 0.5 cm left in the vial, spray and wipe with 70% isopropyl alcohol and transfer into the BSC. Transfer the contents of the cryovial to a 15 ml conical tube with a 2 ml serological pipette. Add 1 ml of Neural Stem Cell Expansion Medium to the empty cryovial and then transfer 8 ml of Neural Stem Cell Expansion Medium onto the thawed cells in a slow, drop wise manner while gently shaking the tube. This is done to lessen the risk of osmotic shock. Transfer the rinse from the cryovial to the 9 ml of cell suspension. Transfer the conical tube onto ice and repeat steps 9.4-9.5 for all remaining vials. Centrifuge the conical tubes at 200 x g for 5 min at 4 °C. During the centrifugation, prepare the appropriate number of flasks for seeding based on Table 4. Table 4. Flask sizes based on the number of cryovials thawed. Suggested volume and flask size to seed hNPCs post-thaw. Re-suspend and combine all tubes in the appropriate volume of MM based on Table 4. Mix well and remove a sample for viability counting. See steps 8.15-8.16 for counting details. The standard seeding range is between 160,000-320,000 cells/cm2. Mix the cells well and aliquot the cells into flasks. Transfer the flasks to a 5% CO2/37 °C/95% humidity incubator. Mix the flask by gently shaking back and forth to evenly distribute the cells. The cells will form spheres within 24-48 hr. Occasionally the cells will adhere to the plastic surface and form a honeycomb-like colony distribution. If this occurs, leave the cells for 3 days before rinsing the cells loose, aiding in sphere formation. Rinse every 1-3 days until there are no adherent cells. If necessary transfer the cells to a new flask. Exchange 25-75% of the media with MM every 3-4 days until the cells are ready to chop, usually 7-14 days post-thaw. Figure 5. Representative data. A) Projected cell numbers of hNPCs frozen at p19, then thawed and expanded as an adherent monolayer using enzymatic dissociation compared to neurospheres passaged via the chopping method. Day 0 represents when the cells were thawed at p20. B) Representative images of spheres pre-chop, 10X. C) Representative images of spheres post-chop, 10X. D) Color swatch used to describe the extent of media conditioning in cGMP-comparable protocols. E) Immunocytochemistry of thawed p29 hNPCs that were plated for 1 day and stained for nestin (red) expression. Hoechst nuclear counter stain (blue). F) Immunocytochemistry of thawed p29 hNPCs that were plated for 7 days and stained for GFAP (Red) and β–III tubulin (Green). Click here to view larger image. Figure 5A represents hNPCs thawed at p20 (day 0) and maintained adherent to laminin-coated tissue culture flasks or as non-adherent neurospheres passaged via the chopping method. The adherent cells were enzymatically dissociated using TrypLE Select weekly and senesced after 70 days (7-10 passages) in culture. In contrast, the neurospheres thawed at passage 20 and expanded via the chopping technique grew for greater than 40 passages before senescence. Typical hNPCs before chopping (Figure 5B) should be mostly ≥ 300 µm in diameter. Once chopped, the spheres are generally quartered into variably sized sections, mostly around 200 µm in diameter (Figure 5C). It is important to note that hNPCs expanded via the chopping method maintain the expression of hNPC markers and can produce both astrocytes and neurons post-differentiation. Late passage hNPCs were dissociated, plated onto laminin-coated coverslips for a period of one or seven days and subsequently fixed with 4% paraformaldehyde. The hNPCs express the progenitor cell marker nestin (Millipore, 1:1,000) on 1 day plated hNPCs (Figure 5E) as well as the differentiated neural markers glial fibrillary acidic protein (GFAP, 1:500) and β–III tubulin (1:2,000) on the seven day plated hNPCs (Figure 5F), markers for astrocytes and immature neurons, respectively. Figure 6. Chopping Schematic. Expanding spheroid stem/progenitor cells in culture using the mechanical chopping method. An overview of the chopping expansion paradigm is shown in Figure 6. hNPC sphere size is one of the important criteria to observe before passaging the neurospheres. Although there is a large variance in sphere size, at least 30% of the spheres should have a diameter greater than 300 µm. If the spheres are too small to passage, simply exchange the CM with fresh MM (25%-50%) and re-assess after 1-4 days. Poor expansion rates occur when the spheres are passaged at too small of a diameter. hNPC expansion rates are also dependent on sphere density and media conditioning due to secreted factors47. However, if the media is overly metabolized and important growth factors are diminished, the cells may acquire a karyotypically abnormal population of cells48. Therefore, replacing nutrients and growth factors must be balanced with secreted trophic factors. When seeding hNPCs post-chop or post-thaw, the number of neurospheres per cm3 of media is variable. However, the general rule is the greater the density, the faster the media will condition and the higher the expansion rate, provided the media is exchanged when needed. Use the media-conditioning color spectrum (Figure 5D), which ranges from pink when un-metabolized, to yellow when the media has been fully metabolized. The ideal media color for logarithmic growth is a reddish-orange color, #3 on the color swatch. This indicates the media contains sufficient nutrients and growth factors while maintaining an adequate concentration of secreted trophic factors. The media should not condition past #4 on the color swatch. Alternatively, when the cells are not metabolizing media quickly (#1 on the color swatch), the hNPCs will grow slower and require a chop every 10-20 days as opposed to every 7-10 days. It is important to increase the culture density to boost conditioning, which will in turn improve expansion rates. During the chopping procedure note the following critical steps. Ensure the blade is installed parallel to the chopper arm. If the blade is not flat on the surface of the Petri dish or shim disc, many spheres may not be chopped. Note the spread of cells discussed in step 4.11. The spheres must remain in the center of the Petri dish or the blade will contact the wall before all spheres have been chopped. Finally, it is important to avoid drying the hNPCs for an extended period of time during the chopping process. After placing spheres in the dish, chop and flood them with fresh media as soon as possible. As this technique requires several pieces of equipment, there can be risks to the sterility of the culture. Given this risk, proper sterile technique must be used throughout the procedure. For basic research level production, wiping down all equipment with 70% IPA or equivalent is sufficient along with optional ultraviolet incubation for a minimum of 15 min. Perform all steps inside of a sterile BSC. For cGMP level production, the chopper must be sterilized with ethylene oxide as suggested by the manufacturer. All other supplies can be purchased sterile or autoclaved. The transition of any basic research therapy from the bench to the bedside can be a challenge. The chopping procedure was designed with this transition in mind. The procedure has already been used to produce a cGMP-compliant hNPC bank at the University of Wisconsin Waisman Center Bio-manufacturing Facility. That hNPC bank was sourced for the expansion of a pharmaceutical-grade hNPC cell lot that will be used for new pre-investigational drug studies and a phase 1 clinical trial following Federal Drug Administration approval. There are other cells types that use this procedure for expansion. An example are EZ spheres, neural stem cells generated from pluripotent stem cells41. This technique has great potential for use with other types of tissue that require constant cell-to-cell contact during expansion. We thank Dr. Soshana Svendsen for critical review and editing of this report. This work was contributed to by the NIH/NINDS 1U24NS078370-01 and CIRM DR2A-05320. Freezing Chamber, Isopropyl Alcohol Nalgene 5100-0001 "Mr. Frosty"
McIlwain Tissue Chopper Lafayette Instruments TC752-PD Petri dish modification required. CAUTION: Moving, sharp blade. Cattaneo, E., McKay, R. Proliferation and differentiation of neuronal stem cells regulated by nerve growth factor. Nature. 347, 762-765 (1990). Palmer, T. D., Takahashi, J., Gage, F. H. The adult rat hippocampus contains primordial neural stem cells. Molecular and cellular neurosciences. 8, 389-404 (1997). Wu, Y., Liu, Y., Chesnut, J. D., Rao, M. S. Isolation of neural stem and precursor cells from rodent tissue. Methods in molecular biology. 438-4339 (2008). Svendsen, C. N., Fawcett, J. W., Bentlage, C., Dunnett, S. B. Increased survival of rat EGF-generated CNS precursor cells using B27 supplemented medium. Experimental brain research. Experimentelle Hirnforschung. Experimentation cerebrale. 102-407 (1995). Laywell, E. D., Kukekov, V. G., Steindler, D. A. Multipotent neurospheres can be derived from forebrain subependymal zone and spinal cord of adult mice after protracted postmortem intervals. Experimental neurology. 156-430 (1999). Azari, H., Rahman, M., Sharififar, S., Reynolds, B. A. Isolation and expansion of the adult mouse neural stem cells using the neurosphere assay. J Vis Exp. 45, (45), (2010). Temple, S. Division and differentiation of isolated CNS blast cells in microculture. Nature. 340, 471-473 (1989). Chalmers-Redman, R. M., Priestley, T., Kemp, J. A., Fine, A. In vitro propagation and inducible differentiation of multipotential progenitor cells from human fetal brain. Neuroscience. 76, 1121-1128 (1997). Ostenfeld, T., et al. Regional specification of rodent and human neurospheres. Brain research. Developmental brain research. 134, 43-55 (2002). Carpenter, M. K., et al. et al. In vitro expansion of a multipotent population of human neural progenitor cells. Experimental neurology. 158, 265-278 (1999). Nunes, M. C., et al. Identification and isolation of multipotential neural progenitor cells from the subcortical white matter of the adult human brain. Nature. 9, 439-447 (2003). Piao, J. H., et al. Cellular composition of long-term human spinal cord- and forebrain-derived neurosphere cultures. Journal of neuroscience research. 84, 471-482 (2006). Barami, K., Zhao, J., Diaz, F. G., Lyman, W. D. Comparison of neural precursor cell fate in second trimester human brain and spinal cord. Neurological research. 23, 260-266 (2001). Walder, S., Ferretti, P. Distinct neural precursors in the developing human spinal cord. The International journal of developmental biology. 48, 671-674 (2004). Buc-Caron, M. H. Neuroepithelial progenitor cells explanted from human fetal brain proliferate and differentiate in vitro. Neurobiology of. 2, 37-47 (1995). Becq, H., Jorquera, I., Ben-Ari, Y., Weiss, S., Represa, A. Differential properties of dentate gyrus and CA1 neural precursors. Journal of. 62, 243-261 (2005). Keenan, T. M., Nelson, A. D., Grinager, J. R., Thelen, J. C., Svendsen, C. N. Real time imaging of human progenitor neurogenesis. PloS one. 5, (2010). Kim, H. J., McMillan, E., Han, F., Svendsen, C. N. Regionally specified human neural progenitor cells derived from the mesencephalon and forebrain undergo increased neurogenesis following overexpression of ASCL1. Stem cells. 27, 390-398 (2009). Windrem, M. S., et al. Neonatal chimerization with human glial progenitor cells can both remyelinate and rescue the otherwise lethally hypomyelinated shiverer mouse. Cell stem cell. 2, 553-565 (2008). Kitiyanant, N., Kitiyanant, Y., Svendsen, C. N., Thangnipon, W. B. D. N. F. - IGF-1- and GDNF-secreting human neural progenitor cells rescue amyloid beta-induced toxicity in cultured rat septal neurons. Neurochemical research. 37, 143-152 (2012). Dutta, S., et al. Cell therapy: the final frontier for treatment of neurological diseases. CNS neuroscience & therapeutics. 19, 5-11 (2013). Lindvall, O., Barker, R. A., Brustle, O., Isacson, O., Svendsen, C. N. Clinical translation of stem cells in neurodegenerative disorders. Cell stem cell. 10, 151-155 (2012). Wang, S., et al. Long-term vision rescue by human neural progenitors in a rat model of photoreceptor degeneration. Investigative ophthalmology & visual science. 49, 3201-3206 (2008). Kitchens, D. L., Snyder, E. Y., Gottlieb, D. I. FGF and EGF are mitogens for immortalized neural progenitors. Journal of. 25, 797-807 (1994). Craig, C. G., et al. In vivo growth factor expansion of endogenous subependymal neural precursor cell populations in the adult mouse brain. The Journal of neuroscience : the official journal of the Society for Neuroscience. 16, 2649-2658 (1996). Ciccolini, F., Svendsen, C. N. Fibroblast growth factor 2 (FGF-2) promotes acquisition of epidermal growth factor (EGF) responsiveness in mouse striatal precursor cells: identification of neural precursors responding to both EGF and FGF-2. The Journal of neuroscience : the official journal of the Society for Neuroscience. 18, 7869-7880 (1998). Kelly, C. M., et al. EGF and FGF-2 responsiveness of rat and mouse neural precursors derived from the embryonic CNS. Brain research bulletin. 68, 83-94 (2005). Sun, Y., et al. Long-term tripotent differentiation capacity of human neural stem (NS) cells in adherent culture. Molecular and cellular neurosciences. 38, 245-258 (2008). Vescovi, A. L., Reynolds, B. A., Fraser, D. D., Weiss, S. bFGF regulates the proliferative fate of unipotent (neuronal) and bipotent (neuronal/astroglial) EGF-generated CNS progenitor cells. Neuron. 11, 951-966 (1993). Gritti, A., et al. Multipotential stem cells from the adult mouse brain proliferate and self-renew in response to basic fibroblast growth factor. The Journal of neuroscience : the official journal of the Society for Neuroscience. 16, 1091-1100 (1996). Chojnacki, A., Weiss, S. Production of neurons, astrocytes and oligodendrocytes from mammalian CNS stem cells. Nature. 3, 935-940 (2008). Ferrari, D., Binda, E., De Filippis, L., Vescovi, A. L. Isolation of neural stem cells from neural tissues using the neurosphere technique. Current protocols in stem cell biology. Chapter. 2, 10-1002 (2010). Ebert, A. D., McMillan, E. L., Svendsen, C. N. Isolating, expanding, and infecting human and rodent fetal neural progenitor cells. Current protocols in stem cell biology. Chapter 2, Unit 2D 2, doi:10.1002/9780470151808.sc02d02s6. (2008). Svendsen, C. N., et al. Long-term survival of human central nervous system progenitor cells transplanted into a rat model of Parkinson's disease. Experimental neurology. 148, 135-146 (1997). Draper, J. S., et al. Recurrent gain of chromosomes 17q and 12 in cultured human embryonic stem cells. Nature. 22, 53-54 (2004). Buzzard, J. J., Gough, N. M., Crook, J. M., Colman, A. Karyotype of human ES cells during extended culture. Nature biotechnology. 22, 381-382; author reply 382. 10-1038 (2004). Mitalipova, M. M., et al. Preserving the genetic integrity of human embryonic stem cells. Nature. 23, 10-1038 Forthcoming. Svendsen, C. N., et al. A new method for the rapid and long term growth of human neural precursor cells. Journal of neuroscience. 85, 141-152 (1998). Baghbaderani, B. A., Mukhida, K., Hong, M., Mendez, I., Behie, L. A. A review of bioreactor protocols for human neural precursor cell expansion in preparation for clinical trials. Current stem cell research & therapy. 6, 229-254 (2011). Ebert, A. D., et al. EZ spheres: A stable and expandable culture system for the generation of pre-rosette multipotent stem cells from human ESCs and iPSCs. Stem cell research. 10, 417-427 (2013). Ebert, A. D., et al. Induced pluripotent stem cells from a spinal muscular atrophy patient. Nature. 457, 277-280 (2009). Consortium, H. D. iP. S. C. Induced pluripotent stem cells from patients with Huntington's disease show CAG-repeat-expansion-associated phenotypes. Cell stem cell. 11, 264-278 (2012). Gamm, D. M., Nelson, A. D., Svendsen, C. N. Human retinal progenitor cells grown as neurospheres demonstrate time-dependent changes in neuronal and glial cell fate potential. Annals of the New York Academy of Sciences. 1049-10107 (2005). Hosoyama, T., Meyer, M. G., Krakora, D., Suzuki, M. Isolation and in vitro propagation of human skeletal muscle progenitor cells from fetal muscle. Cell biology international. 37, 191-196 (2013). Sareen, D., et al. Inhibition of apoptosis blocks human motor neuron cell death in a stem cell model of spinal muscular atrophy. PloS one. 7, (2012). Chang, M. Y., Park, C. H., Lee, S. H. Embryonic cortical stem cells secrete diffusible factors to enhance their survival. Neuroreport. 14, 1191-1195 (2003). Sareen, D., et al. Chromosome 7 and 19 trisomy in cultured human neural progenitor cells. PloS one. 4, (2009). Posted by JoVE Editors on 09/01/2014. Citeable Link.